Christmas is just around the corner and with that comes something dreaded by all our four-legged family members – pet-sized reindeer antlers. You know the ones I’m talking about. At some point they’ve been placed on the top of you dog or cat’s head to embarrass them for the sake of a goofy family photo. Well, seeing as it is our first Christmas this year with both Shadow and Whiskey, you’d think that we would attempt this much abused holiday tradition, but I just couldn’t do it. It was bad enough that I’ve had Whiskey rockin’ a Christmas sweater. 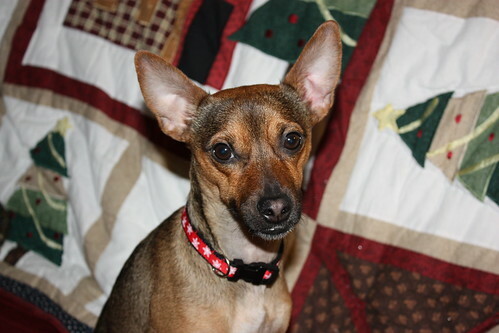 It seemed like the nicer (and kinder) idea was to give the two newest members of the family some new Christmas collars. 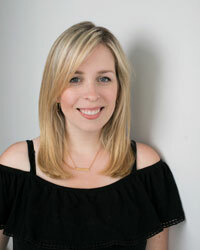 Fancy dog collars run for about $10-20, but making your own costs no more than $5 (and even less if your dog is a half pint like the Whiskinator). 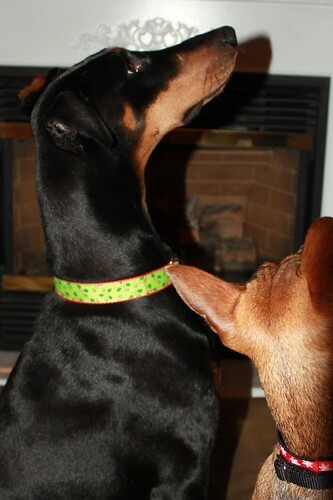 Using this easy-to-follow tutorial at Uberpest, I found the basic instructions on how to make a dog collar. 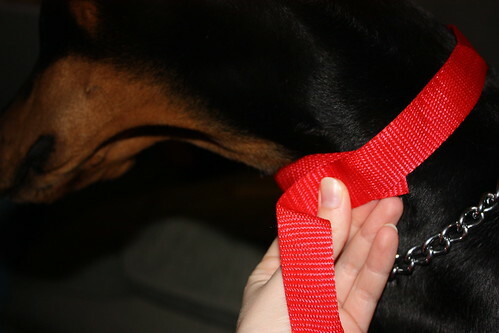 Then I used some 1″ wide red nylon webbing and measured how much I would need to make a collar for Shadow. To give the collar some festive flair, I bought a contrasting printed ribbon (50% off at the fabric store. Woohoo!) that was slightly narrower than the webbing. 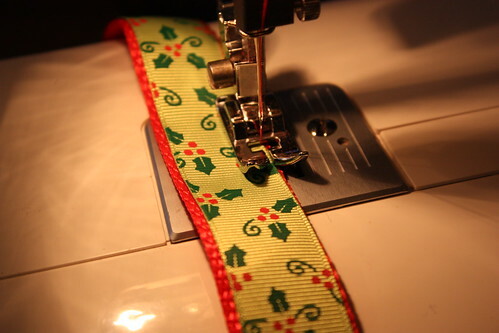 I pinned it to the webbing so that it was evenly spaced on both sides and stitched it close to the edge on both sides of the ribbon for the entire length. Then I followed the rest of the directions on Uberpest. 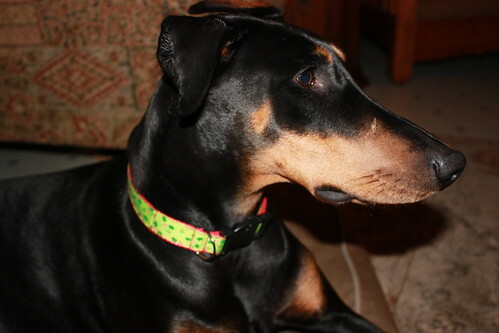 And there you have a simple and inexpensive dog collar that you can make for any occasion. Make sure to really reinforce the stitches, because the last thing you want is for the collar to loosen while you’re at the dog park. And of course Whiskey couldn’t be left out of all the holiday fun. 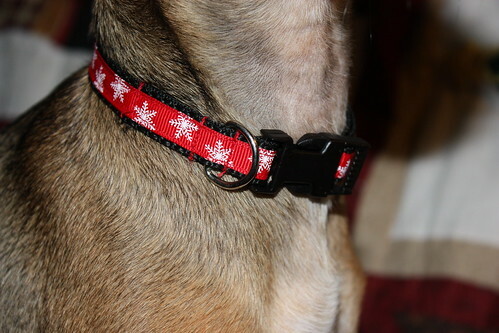 He got his own black collar with a red and white snowflake ribbon. Awfully handsome and festive, right? To make his collar a little more proportionate to his size, I used a 1/2″ wide nylon webbing and a 1/4″ wide printed ribbon. 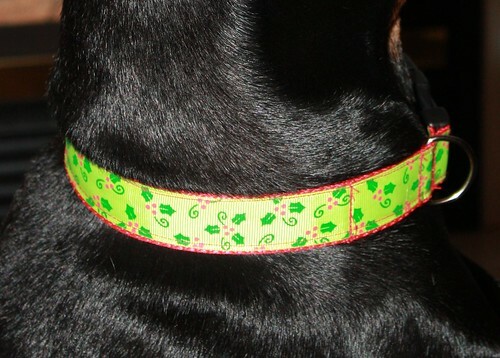 You don’t need to limit yourself to just Christmas collars – the possibilities are endless. Plus if you ever want to replace the nylon webbing or make a new collar, you can reuse the hardware. You’re so crafty, what a great idea! I still have Moo’s Santa hat from last year, and I’m debating if I should it or not….he always looks so pained when I put it on him!